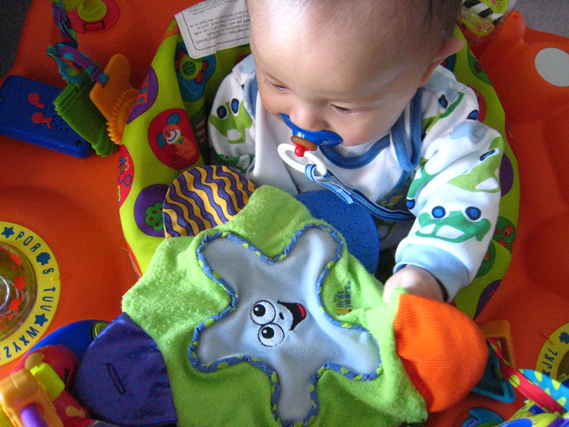 Matthew enjoys this teething blanket even though he was not teething quite yet. I gave him this blanket when he was 5 months old and he just enjoys touching the material and looking at the colorful and vibrate color/patterns. The sound from the squeeze really surprises him and he gets excited when he hears it. I also play catch with him using this little blanket. Occasionally I’ll let him have it and he thinks he caught it. He would then hold it tightly and won’t let go. It’s so funny to watch him. Once he is truly teething, I’m sure he’ll love the plastic part of this blanket for biting. Note: Every baby is different. Our information is to be used as a reference. We do not hold responsible for your purchase decisions as results may vary. YES! While I can’t speak for everyone but for myself and many of my friends who own one, we love it! Matthew has been having so much fun in it that we probably should cut down his usage. At 7 month old, he can now turn and play with each toy in the exersaucer. He looks at the mirror and smile at himself. We love it because it allows us to do other things worry-free of Matthew. I finally decided to get this playard for a couple of reasons. Matthew has always slept in his own room/crib. This winter weather has been brutal and he got sick from what we think is getting a cold after kicking off his blanket during sleep. We couldn’t help him since we don’t sleep in the same room with him. For the past weeks, we had him in a travel bed/box next to our bed so we can give him better care at night. The travel bed/box is proving to be too tight for him so now this Jeep Playard came to rescue at a perfect time. I like the fact that it can be collapsed into travel size luggage. This means I can bring it to my parents place for overnight stays. It’s a playard so Matthew can use it when he’s older. It’s got storage space too so I can avoid having to carry a diaper bag when staying at my folk’s. + Compact – This is what attracted me to this playard in the first place. We currently use it as a crib so that Matthew can sleep next to us. I will be able to take it to my parents’ house easily. My husband was doubtful about this product at first but after seeing it, he loves it, too. + Great Design – This Jeep playard is easy to fall in love with given it’s looks. I think it’s overall size is relatively less bulky compared to traditional playard. 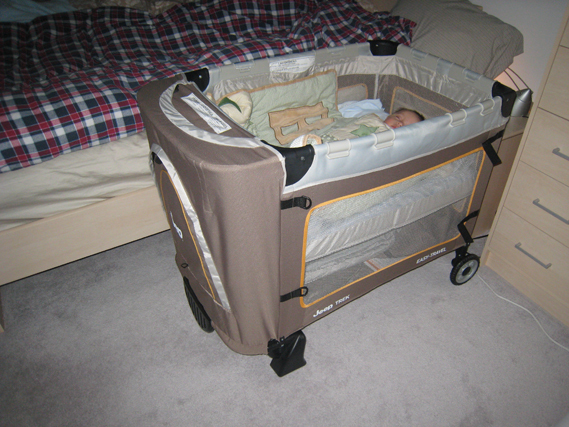 +Storage – Plentiful space can be used while the playard is in use or when collapsed. – Changing Pad – It’s too small to be useful since Matthew is almost 7 months when we got the playard. I can see it being useful with a newborn, though. I think we’ll definitely make use of it if we have another baby. First big purchase for Matthew was a car seat and a stroller. I was just 4 months into my pregnancy but with a 20% discount coupon nearing expiration, we decided to spend it on a car seat and a stroller. We didn’t even know what we were having at the time. While I had to stick with neutral colors, we carefully made our decision based on safety, weight, functionality, size, and price. 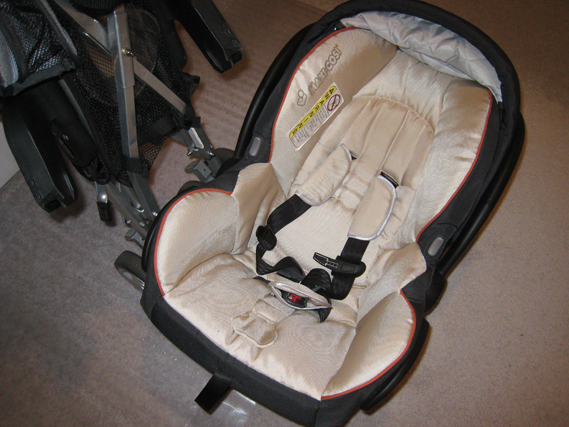 + Good Size – Since we live in an apartment and storage is often an issue, the size of the stroller and car seat is ideal for us. I especially am satisfied with how it fits well in our car trunk. One time I had another stroller (a friend’s) which was a Chicco one and was able to fit both our stroller and the Chicco stroller in the truck. I would not have been able to do that with two Chicco strollers. 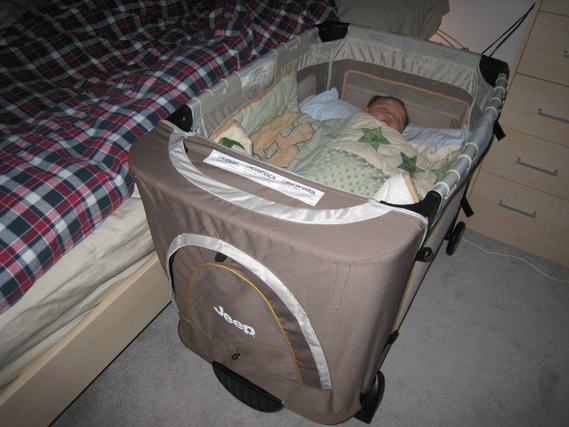 + Relatively Light Weight – We test a few travel systems and we definitely find Maxi-Cosi relatively lighter. It makes it easier for me taking the car seat in and out of the car. I do this twice daily since Matthew goes to daycare 5 days a week. +Very Easy Fold – Seriously just 3 steps. I was intimidated at first but after 2 tries, I nailed it. 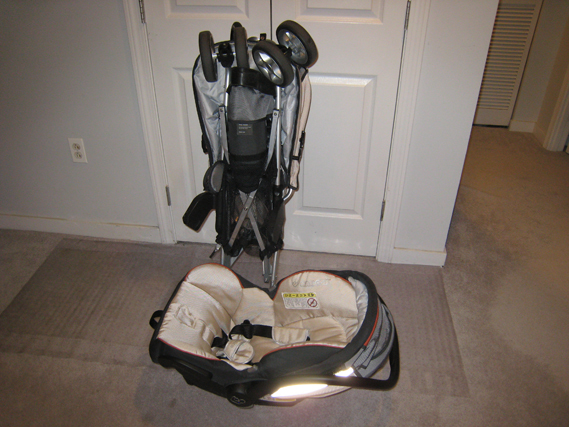 It folds up like just an unbrella stroller which I like over the Chicco or Graco strollers. It doesn’t have a tray but that’s not a big deal. +Comfortable Cushion – The cushioning is very comfortable yet stylish. We don’t even bother using a BundleMe considering the cold winter that we have in New England. 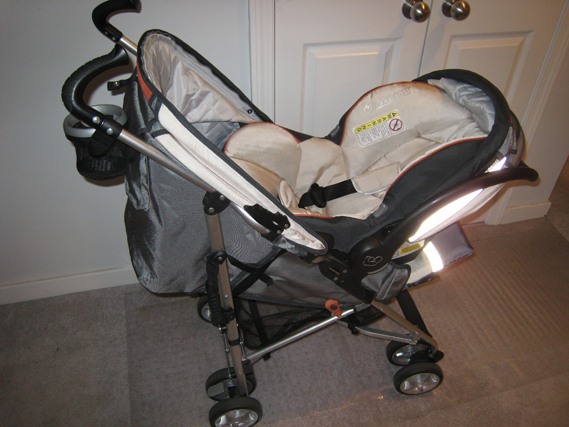 – Strap Issue – A very minor issue when collapsing the stroller. A piece of strap always gets in the way during folding right at the lock area. I can easily just take it out. Now that I have done so many times folding the stroller, it has become an automatic reaction. – Small Wheels – I like bigger wheels because the maneuverability is much better but I’m ok with the small wheels because storage is a more important factor to me. While I’m not a fan of pacifiers but I also don’t like when Matthew chews on his fingers because he touches many germ-filled things at daycare. The Nuk pacifiers work the best for him and it really calms him down. He really needs it when he’s tired and sleepy. I don’t give it to him unless he shows signs of uneasiness. 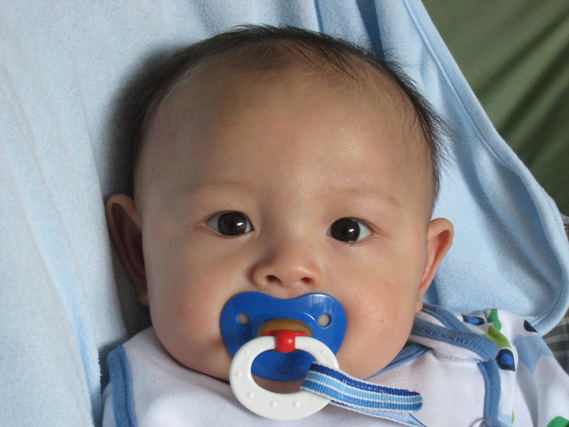 I like this pacifier also for it’s availability at just about any supermarkets and drugstores. You would be surprised how easily you can lose one so buy several of them. They do run 3+ months, 6+ months and 18+ months sizes. Get the chain so you can always attach it to your baby’s bib or shirt. After a long debate, we decided to get an exersaucer. For a while, I didn’t want to spend on another major toy thing that Matthew may out-grow quickly. At 5 months old, he is very active and always wants to be held standing up. I just get very tired especially since he is growing heavier and heavier. + Easy Assembly – When I opened the instruction book, I thought I was in trouble. It looked so complicated. Then I followed each step one by one and after about half an hour, there it is. What a colorful thing. 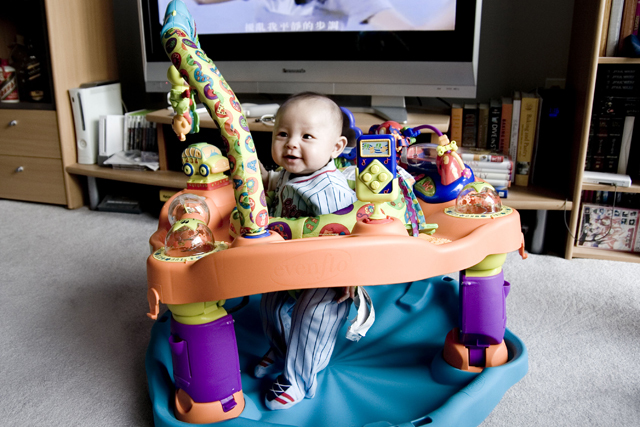 + Many Toys – There are many musical interaction points on this exersaucer it will be sure to keep your baby’s attention. Matthew loves it and he gets excited going in there. + Adjustable Height – This product should have some longevity unlike other thing Matthew has quickly out-grown. – Bulky – Perhaps not qualified to be a negative factor since all exersuacers are bulky. I would say this one is medium size compared to the smaller Bright Starts Bounce Bounce Baby Activity Zone which could be an option for you. This A through Z multi-textured 50 piece foam alphabet puzzle set is such a colorful tile set. I put it out in Matthew’s room and it’s the perfect play ground. Each foam tile piece is soft and strong and not to mention it’s great for pictures. Matthew loves doing tummy time on it. Each interlocking square is 12X12 complete with boarders. The mat when put together covers 24 square feet. It should come handy when Matthew learns letters.